I’m not sure where to post or say this so I will just reply to you. 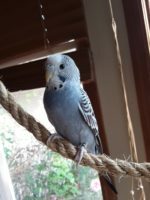 My Budgie Jet flew away on Halloween 2018. I opened the door to blow out the candles in the pumpkins and she got out of her cage and flew out. She is not fond of strangers and is fully flighted. She loves millet and loves to listen to songs. She doesnt like to be touched but she will warm up to you if you have millet.